June 10, 2017 (Tony Cartalucci - LD) - Sputnik recently published an article titled, "Censored Speech: Criticizing Monarchy Lands Thai Man 35-Year Jail Sentence," citing AFP and two alleged "rights watchdogs," iLaw and Thai Lawyers for Human Rights. The article portrays the accused as a victim of censorship and laws that undermine his human rights. In reality, Vichai Thepwong is a supporter of Thailand's opposition which consists of ousted US-backed proxy, Thaksin Shinawatra, his Pheu Thai Party (PTP), and his armed street front, the United Front for Democracy Against Dictatorship (UDD) - better known as "red shirts" - as well as a myriad of US State Department-funded fronts including both iLaw and Thai Lawyers for Human Rights. 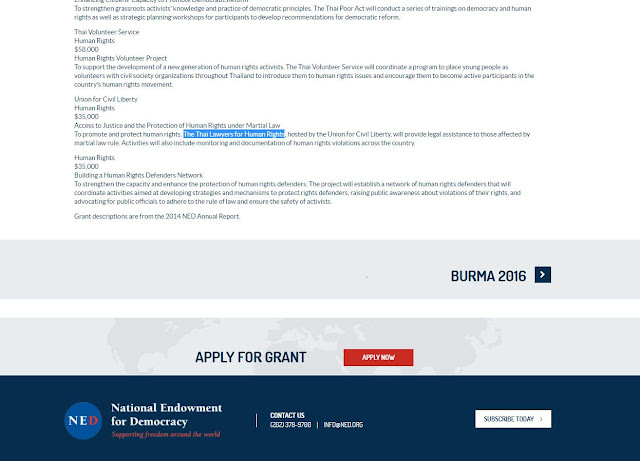 Thai Lawyers for Human Rights is listed on the US NED website, while iLaw reveals its NED funding as well as funding from convicted financial criminal George Soros' Open Society on its own website. Why Does the US Seek to Undermine Thailand's Monarchy? Thaksin Shinawatra, while in power would mass murder nearly 3,000 in a 90 day "war on drugs," brutally suppressed criticism of his regime, disappeared or had assassinated over 18 activists, and upon being ousted from power in 2006, would use his "red shirt" movement to sow armed violence and arson across the nation in 2009 and again in 2010 killing two and nearly one hundred respectively. When his sister took power between 2011 and 2014, the red shirts would emerge again to confront protesters in the streets seeking to oust her. Twenty-eight more would die in mayhem involving red shirt militants wielding automatic weapons, grenade launchers, hand grenades, and pistols in nearly nightly attacks. 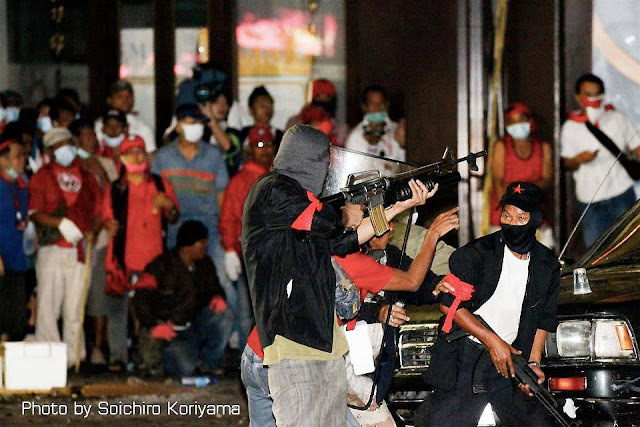 Since the 2014 military coup that ousted Shinawatra's sister, red shirts have carried out multiple terrorist attacks involving improvised explosive devices. Multiple militant cells have been caught stockpiling weapons and preparing for large scale violence similar to that which started the now-ongoing conflicts in Libya and Syria. The US backs the political party of Thaksin Shinawatra and the myriad of fronts and organizations that prop it up in a bid to overthrow and overwrite Thailand's indigenous institutions - including both the military and the monarchy. Central to this effort is a systematic and ongoing public relations campaign to attack and undermine the monarchy as well as portray those caught and sentenced for foreign-funded subversion as victims of human rights violations. It is a campaign not unlike that which the US NED supports in Russia that Russian media organizations like Sputnik and RT were created to counter. Unfortunately, through sloppy reporting, both organizations have repeatedly aided the US in its efforts to undermine Thailand's political stability. Beyond creating a client regime in Thailand, the US also seeks to use overturned or destabilized nations in Southeast Asia as a means of encircling and containing China's rise as a global superpower. Remiss reporting and analysis by the alternative media including this most recent article by Sputnik, only accelerates US efforts and hinders attempts to establish a multipolar world order in which geopolitical power is more equally distributed between and within nations.